"Daughters of Diaspora" is expanding, diversifying and unapologetically existing. Since I debuted and published the first twenty "daughters" back in May 2016, I've continued to work on increasing and diversifying my portrayal of millennial African women. 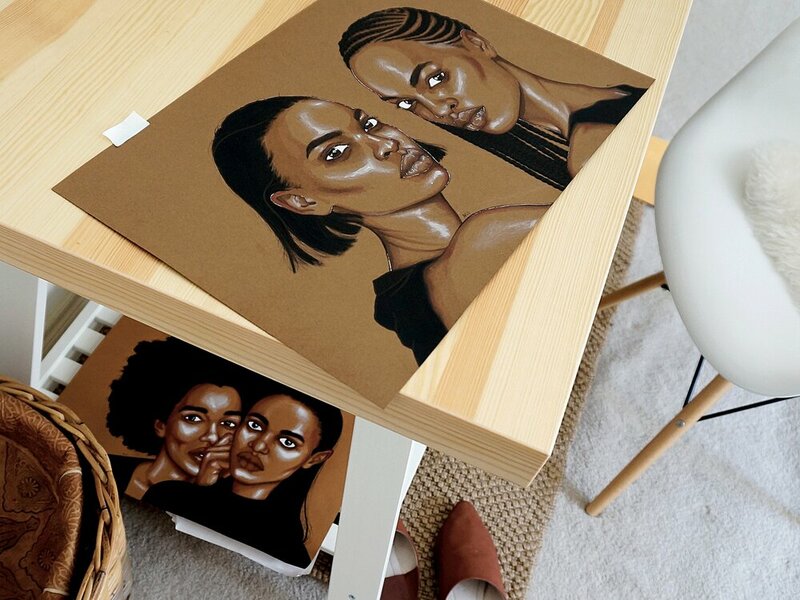 Inspired by our unique beauty and diversity, I've completed about ten new portraits, while continuing to research and think about what it means to be "daughters of diaspora". Much of our identity is handed down to us from our parents. We're supposed to want to be doctors, lawyers or engineers; asexual throughout our teens but suddenly committed in a heterosexual relationship by our early twenties; studious, obedient, conservative and, most of all, not too entrenched in "Western" values. Some of us comply, others of us rebel--but regardless, we're burdened with the knowledge that the future we choose for ourselves is expected to validate the struggles of our immigrant parents. Although these pressures can affect both "daughters" and "sons", studies show that there are greater expectations on women to uphold family traditions and cultural norms in the way we adorn our bodies, our ability to cook traditional foods and our responsibility to the family. Our capacity to do so reflects not only on our parents, but on the entire community. In some cases, the cultural expectations placed on women are rooted in a romanticized nostalgia for "back home" and not actual cultural traditions. Consequently, women's bodies are more likely to be policed, as we are regarded as physical embodiments of our cultural heritage. After a lot of reflection, I realized this is why I like to leave my portraits free of cultural cues. First and foremost, I want to portray autonomous, dignified and independent individuals. Many of them gaze fiercely back at the viewer, asserting a certain level of sentience. Secondly, the women I portray aren't meant to meet outside expectations of what it means to be "black" or "African" or a "good daughter". They simply exist, in their own right and in their own way. Any beliefs or conclusions that are projected onto them are the result of the person looking, not the individual being looked at. I wish I had understood this sooner--that how others see you is not who you are--but I'm glad to have learned it now.